There are assholes and there are fuckwits! – Here is a mix of the two in one massive crowd or protest.. whatever you call it. It was an incredible Round-of-16 game between Colombia and Uruguay. Thanks to star striker James Rodriguez, the Colombian national soccer team managed to defeat Uruguay 2-0 and advance in the nail-biting tournament. Next, Colombia will play against Brazil on Friday and it will be quite a sight to see Rodriguez face off against Neymar. 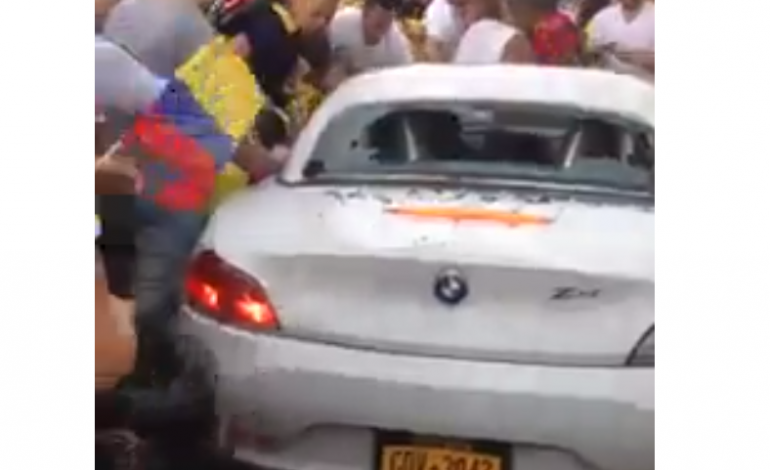 Colombia soccer fans across the world are ecstatic to see that their team is advancing in the World Cup, but a particular celebration in Queens, NY, sadly went awry as violent fans were filmed taking over the streets and relentlessly attacking a vehicle attempting to thread through the crowd. 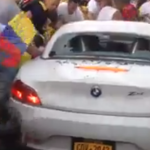 A white BMW Z4 convertible can be seen making its way through a wild Colombian soccer mob when suddenly a man wearing a black t-shirt kicks the side of the car repeatedly. Other people on the streets join in the attack, kicking and pounding against the car. Next, a man in a yellow Colombia national soccer jersey ran to the car and puts his elbow right through the back window. A man puts his foot through the right tail light while another stomps across the entire length of the car. At this point, the terrified driver inside the BMW picks up the pace and begins to accelerate through the crowd. The swarm of people scramble away from the path of the oncoming BMW as some rowdy bystanders can be heard cheering and jeering at the BMW. Finally, a police car is stopped at an intersection at the end of the street and the BMW Z4 pulls to the side of the road. Details on the incident are limited but a thread of Facebook comments shed light on what is going on. Some commenters are fellow soccer fans from Colombia and vocalized their shock and disappointment from the sight of how the fans acted in the video. Some commenters stated that the World Cup is ultimately just a sporting event and it is not an excuse for fans to take over the streets and act irresponsibly. Several Colombian commentors claimed that the drunk and violent actions depicted in this film give Colombians a bad reputation. Other commenters say the car should not have been on that street in the first place. A handful of comments claimed that the car had struck over a couple without stopping. According to the comments, the camera phones only began recording to capture the angry aftermath.